i saw this project in a diy magazine a couple of weeks ago and loved it! 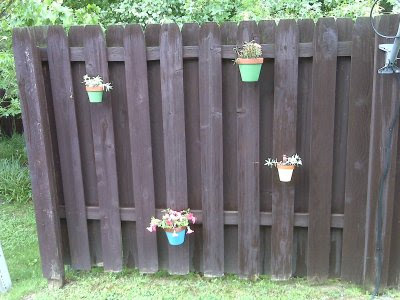 i have a very small back "yard" and since i live in a condo there's not really much i can do back there, so i loved the thought of decorating the fence. 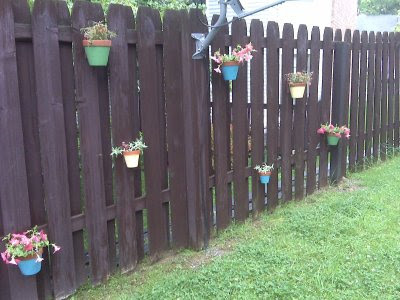 i got these pots from my dad's house (the previous owner left them) and cleaned them up and spray painted them this morning. then mom and i went to lowe's and she helped my pick out the plants. i love the bright colors and the fact that all of these should hang over the pots in a while. 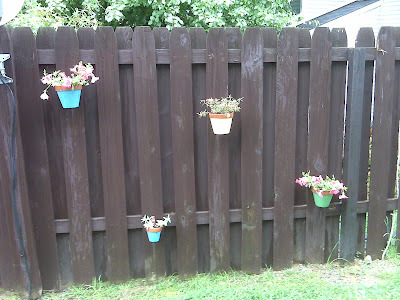 i put the hangers up and mom and i potted the plants, and voila! i LOVE how this turned out...i can't wait until the rain stops and i'm able to sit out there and enjoy them! !